Writer Mayur Didolkar assesses prof Makarand Paranjape’s article on Priyanka Gandhi, and Paranjape writes back to him. Academic and writer Mayur Didolkar responds to professor Makarand Paranjape’s article on Priyanka Gandhi Vadra’s surprise entry into politics, says it’s soft bigotry. Paranjape, on his part, argues that the Right wing must not be intolerant to truths about dynasty. After professor Makarand Paranjape’s strangely laudatory piece about Priyanka Gandhi Vadra and Rahul Gandhi—the Gandhi siblings—in ThePrint, I thought a brief intervention is in order, as much to ask a few questions to the good professor to steer the online debate in the right direction. To note what was missing from the piece, rather than a referendum on the motives behind it. Paranjape welcomes Priyanka Gandhi’s entry into active politics as general secretary and head of eastern UP for the 2019 campaign. And of course, while no rational person would object to anyone supporting any political leader, the chain of thoughts elucidated in the op-ed requires discussion. Sibling support is essentially a human trait, which is why we say ‘blood is thicker than water’. In fact, so human is the trait that I am really not sure the term ‘superhuman’ is used in the correct context here. Superman, Wonder Woman, Batman, Ironman—do any of these characters have siblings? Also Read: Is Priyanka Gandhi Congress’ brahmastra for 2019 or will Vadra scandals weigh her down? The next paragraph about Priyanka not passing a single ‘damaging’ comment against her brother is what former US President George W. Bush would have termed ‘soft bigotry of low expectations’. Since when did ‘not embarrassing’ your sibling in public become a benchmark for ‘remarkable trait’? Next, the author speaks about the presser post the UP assembly elections in 2012 after the Congress had suffered a humiliating defeat. I hold Prof Paranjape in high esteem, and the intention of this article isn’t to mock him. That said, it is impossible for the above paragraph to not remind of those cute, fawning ‘news’ articles by our entertainment media, like ‘Taimur runs after a kitten, gets a kiss from mom Kareena‘. So a sister, belonging to the same political party, didn’t abandon her brother in public. Call me stone-hearted, but I am still waiting to be moved by it. I think, I could make the case for ‘facts assumed not in evidence’ for the above. What is the measure of success the writer used before stating that Priyanka enjoys tremendous reputation among the rank and file? What demonstrable examples of her practical sense, inner stability, political acumen and poise could Prof Paranjape quote? As I was working on this piece, ANI tweeted RS MP Subramanian Swamy claiming that Priyanka suffers from bipolar disorder. The viciousness of Swamy’s statement apart, isn’t Prof Paranjape’s claims of the Gandhi daughter’s qualities equally unsubstantiated? The comparisons with her grandmother actually ask more questions than they answer. First of all, most of those comparisons are based on how Priyanka looks like her grandmother! Apart from the superficiality of this comparison, the assumption that this comparison speaks well about Priyanka is equally problematic. While I have no doubt the party could do with a campaigner like Indira, I am not sure how many Indians feel ready for an Indira Gandhi redux. Her tenure as Prime Minister saw Emergency, a dark era when people’s civil liberties were trampled upon. Her continuation of her father’s socialist-leaning economic policies kept India’s growth sub-par through the ’70s and the 80s. Many Indians like me, who saw economic opportunities open up under non-dynasty leaders like P.V. Narasimha Rao and Atal Bihari Vajpayee, would be wary of accepting another leader like Indira. There is also sufficient historical evidence about how loyalty to the member of the Nehru-Gandhi family has not always resulted into well-being of the nation as a whole. The idea of an Indira-like leader evoking loyalty is something to worry about, not to admire. The writer further claims Rahul Gandhi has emerged as the undisputed leader of the Congress. While this statement in itself is not inaccurate, what is conveniently left out is the fact that Rahul has emerged as a leader not as a result of any growth the party has achieved during his term as vice president, but because that is how things work in the Congress party. Even the most ardent dynasty supporters would be hard pressed to explain what other options for presidency were considered, and what achievements of the Gandhi scion helped him overcome his closest rival for the president’s post. This is a bit of sleight-of-hand, a clever way to put those who oppose the dynasty rule, and those ‘reconciled to family rule’, on equal moral footing. The people who oppose dynastic politics do so not out of any personal prejudice, but due to the fact that the idea of dynasty runs contrary to the idea of democracy. The people who have reconciled are either the ‘aise hi chalta hain’ style defeatists, or opportunists who know which side their bread is buttered on. Refusing to distinguish between these two groups is a grave injustice to the former. At a larger level, this op-ed fails in assessing Priyanka Gandhi on the parameter that every political leader should be assessed on by neutral observers. What are the tenets of her economic policies? What is her position on the Ram Mandir issue? What side does she come down upon in the LGBT debate? Who forms her zero-day team and what expertise do those people bring to the table? In many ways, Priyanka’s political success depends upon answers to questions like these. To reduce this debate to her love for brother, and her resemblance to grandmother, is at once reductionist for her and condescending to the voters she is going to appeal to. Let’s stop talking down to the masses, shall we? It would be counter-productive point by point to rebut Mayur Didolkar’s reaction to my article. We are at cross-purposes. He doesn’t like Priyanka Gandhi—naturally, he also doesn’t like my praise of her. Nothing I say will make him change his mind. Is there a realisation, however unpleasant or unpalatable, that both the Congress and ‘the family’ cannot be wished away? Across the world from North America to Singapore, dynasties and dynasts—the Kennedys, the Bushes, the Trudeaus, and the Lees, to name a few—have continued to run democratic countries. In the Indian subcontinent, powerful political families have persisted in Pakistan (Sharif, Bhutto), Bangladesh (Sheikh-Wazed, Zia), Nepal (Koirala, Thapa, Pandey), Myanmar (Aung San, Win), Sri Lanka (Bandaranaike, Jayawardene), Mauritius (Duval, Jugnauth, Ramgoolam), and even the Maldives (Gayoom). When it comes to India, several political parties are practically ‘owned’ by families. For instance, SP, Lok Dal (UP), RJD, LJP (Bihar), DMK, AIADMK (Tamil Nadu), BJD (Orissa), JDS (Karnataka), TDP (Andhra), TRS (Telangana), NC, PDP (Kashmir) and so on. Two family-run parties, Akali Dal (Punjab) and Shiv Sena (Maharashtra) are allies of the BJP. In addition, both the Congress and the BJP, the former far more than the latter, have scions of political families in important positions. Families, let us face it, still matter. In all walks of life, at least at this stage of human social evolution, they remain the primary units for the transmission not only of genetic traits and information, but also property, power, prestige, and privilege, not to mention values and qualities. Why else would we use the phrase ‘Sangh Parivar’ even when we detest ‘the family’ so much? Does my article equate dynastic with non-dynastic parties? No, I don’t take a call on this issue—India’s voters must. Do they accord non-dynastic succession a superior moral position? Evidence does not suggest they do. Instead, while families give their political heirs a head start, the heirs must prove themselves. Why should it be any different for Priyanka? 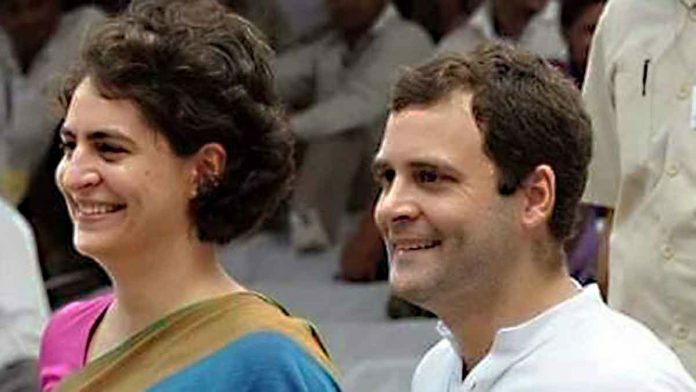 But if sibling solidarity instead of rivalry between Rahul and Priyanka continues to be maintained, the Gandhi family and the Congress will surely benefit. Can anyone afford to deny or ignore that? Something else seems to bother Mr Didolkar. Is it that I have, by praising Priyanka, betrayed the right wing (RW)? I believe just the opposite: the RW by being so intolerant to difference of opinion may end up betraying its own mandate, which is to replace the ‘Illiberal’ liberalism of the Left-Liberals (LeLis). In our tradition, purvpaksha is very important, but today those proclaiming to uphold Indian traditions and values seem more interested in mocking and slandering opponents than trying to understand the strengths or qualities of those very opponents. The RW would do better if it respected diversity and independence of opinion. That might make it less ‘pathetic and laughable’ in the eyes of both friends and foes. Artificial and policed uniformity is inimical to intellectual life. If a public intellectual is bullied or trolled for offering an opinion that diverges from the sanctioned one, it only means that we don’t respect deliberation and argument. A reductive polity and polarised public sphere signals dangerous times for democracy. That is why I am confident that better sense will prevail among right-thinking individuals. They will see the value of truth-telling regardless of who is in office. Seems Prof. Paranjape, whom I have met, listened to, and cheered on has succumbed finally to the Delhi air now that he is safely ensconced at the IAAS. Alas! Could not believe that the cringe-worthy piece on Priyanka came from his desk, rather than Tharoor’s desk. His claims about Priyanka’s worth and qualities seeming to come out of a “family recollections” album, and I wonder what access he has to the dynasty that the ordinary news reporter does not have. And his response to Mayuresh Didolkar’s carefully argued rebuttal also seems to come out of some kind of a Kanhaiya-JNU playbook. What seduces the good professor? “He doesn’t like Priyanka Gandhi—naturally, he also doesn’t like my praise of her. Nothing I say will make him change his mind.” How did Makarand Paranjape come to this conclusion? So anyone who challenges his assertions with logic is “right wing” “intolerant” “hateful” etc etc? Whereas there is nothing in Mayur Didolkar’s response which suggests any of this – except challenging the points on which Paranjape makes his case on Priyanka.